Populus is a genus of deciduous trees in the flowering plants family Salicaceae, characterized by flowers in the form of long, drooping catkins and by spirally arranged leaves with a long petiole that in many species is laterally flattened so that breezes easily cause the leaves to wobble back and forth. This can give the whole tree a "twinkling" appearance in a breeze. Common names applied to various species include aspen, cottonwood, and poplar, with the latter name sometimes applied to all members of the genus. The Populus genus is native to most of the Northern Hemisphere, including beyond the Arctic Circle. Populus species are common ornamental trees and some species also are used commercially for their wood. They have the advantage of growing large very fast. The wood of Populus species is used for making crates, pallets, furniture, matches, paper pulp, and a rougher cardboard-box pulp. Ecologically, members of Populus are important as food for many animals, including beaver, elk, moose, deer, and grouse. The populus species exhibit bi-level functionality as the pursuit of their own individual needs for survival, growth, and reproduction also positions them to provide benefits for the ecosystem and for humans. The Populus genus includes between 25 and 35 species, depending on the taxonomic scheme. Members are medium-sized to large or very large deciduous trees growing to 15 to 50 meters (49 to 164 feet) tall, with trunks up to 2.5 meters (8 feet) in diameter. The bark on young trees is smooth, white to greenish or dark gray, often with conspicuous lenticels; on old trees the bark remains smooth in some species, but becomes rough and deeply fissured in others. The shoots are stout, with (unlike in the related willows) the terminal bud present. The trees tend to be fast-growing but relatively short-lived. The leaves are spirally arranged, and vary in shape from triangular to circular or (rarely) lobed, and with a long petiole. In species in the sections Populus and Aegiros, the petioles are laterally flattened, so that breezes easily cause the leaves to wobble back and forth, giving the whole tree a "twinkling" appearance in a breeze. Leaf size is highly variable even on a single tree, typically with small leaves on side shoots, and very large leaves on strong-growing lead shoots. The leaves often turn bright gold to yellow before they fall during autumn (Meikle 1984; Rushforth 1999). The flowers are mostly dioecious (rarely monoecious) and appear in early spring before the leaves. They are borne in long, drooping, sessile or pedunculate catkins produced from buds formed in the axils of the leaves of the previous year. The flowers are each seated in a cup-shaped disk that is borne on the base of a scale, which is itself attached to the rachis of the catkin. The scales are obovate, lobed and fringed, membranous, hairy or smooth, usually caducous. The male flowers are without calyx or corolla, and comprise a group of 4–60 stamens inserted on a disk. The filaments are short and pale yellow, while the anthers is oblong, purple or red, introrse (facing toward the axis of growth), and two-celled, with cells opening longitudinally. The female flower also has no calyx or corolla, and comprises a single-celled ovary seated in a cup-shaped disk. The style is short, with 2–4 stigmas, variously lobed, and numerous ovules (Meikle 1984; Keeler 1900). 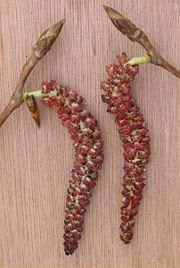 The plants are wind-pollinated, with the female catkins lengthening considerably between pollination and maturity. The fruit is a two to four-valved capsule, green to reddish-brown, which matures in mid summer. It contains numerous minute light brown seeds surrounded by tufts of long, soft, white hairs that aid wind dispersal (Meikle 1984; Keeler 1900). Poplars of the cottonwood section are often wetlands or riparian trees. They are commonly called cottonwoods because of the tufts of cottony hairs on the seeds. The aspens are among the most important boreal broadleaf trees (Meikle 1984). A group of poplars in a field. The genus Populus has traditionally been divided into six sections on the basis of leaf and flower characters (Rushforth 1999; Eckenwalder 1977). This classification is followed below. Recent genetic studies have largely supported this classification, although they do show that the relations between species are somewhat more complex, as evolution of the species has involved genetic recombination associated with interbreeding (reticulate evolution) due to past hybridization events between the groups. Sequences of the nuclear DNA (paternally inherited) and chloroplast DNA (maternally inherited) of some species indicated differing relationships between those species (as noted below). Such disparities of projected relationships are strongly suggestive of hybridization between the species (Hamzeh and Dayanandan 2004). Hybridization continues to be common in the genus, with several hybrids between species in different sections known (Meikle 1984). Populus tremula—Common aspen, trembling aspen or Eurasian Aspen. Europe, northern Asia. This is the type species of the genus. Populus adenopoda—Chinese aspen. Eastern Asia. Populus alba—White poplar. Southern Europe to central Asia. Populus grandidentata—Bigtooth aspen. Eastern North America. Populus sieboldii—Japanese aspen. Eastern Asia. Populus tremuloides—Quaking aspen or trembling aspen. North America. Populus deltoides—Eastern cottonwood. Eastern North America. Populus fremontii—Fremont cottonwood. Western North America. Populus nigra—Black poplar. Europe. Placed here by nuclear DNA; cpDNA places in sect. Populus. Populus angustifolia—Willow-leaved poplar or narrowleaf cottonwood. Central North America. Populus balsamifera—Ontario balsam poplar. Northern North America. Populus laurifolia—Laurel-leaf poplar. Central Asia. 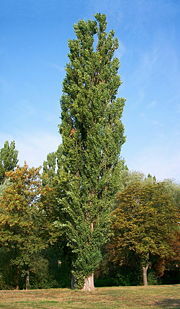 Populus maximowiczii—Maximowicz' poplar. Northeast Asia. Populus simonii—Simon's poplar. Northeast Asia. Populus szechuanica Northeast Asia. Placed here by nuclear DNA; cpDNA places in sect. Aegiros. 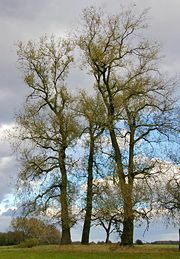 Populus trichocarpa—Western balsam poplar or black cottonwood. Western North America. Populus tristis—Northeast Asia. Placed here by nuclear DNA; cpDNA places in sect. Aegiros. Populus heterophylla—Swamp cottonwood. Southeastern North America. Populus lasiocarpa—Chinese necklace poplar. Eastern Asia. Populus wilsonii—Wilson's poplar. Eastern Asia. Populus euphratica—Euphrates poplar. Southwest Asia. Populus ilicifolia—Tana river poplar. East Africa. In the September 2006 issue of Science, it was announced that Populus trichocarpa was the first tree to have its full DNA code sequenced (JGI 2006). A fastigiate black poplar cultivar of the Plantierensis Group, in Hungary. Many Populus species are common ornamental trees, with some species also popular commercially for their wood. Many aspens and poplars are grown as ornamental trees, with numerous cultivars selected. They have the advantage of growing very big very fast. Trees with fastigiate (erect, columnar) branching are particularly popular, and are widely grown across Europe and southwest Asia, in particular. However, like willows, poplars have vigorous and invasive root systems stretching up to 40 meters (130 feet) from the trees; planting close to houses or ceramic water pipes may result in damaged foundations and cracked walls and pipes due to the roots' search for moisture. The black poplar or European aspen, P. nigra, is common in landscape planting. The wood of Populus species is generally white, often with a slightly yellowish cast. It is sold as inexpensive hardwood timber used for making crates, furniture, pallets, pulp formed into cardboard, and cheap plywood, with more specialized uses including matches and the boxes in which camembert cheese is sold. Poplar wood is widely used in the snowboard industry for the snowboard "core," because it has exceptional flexibility. Paper pulp is a common product of the soft wood of poplars. For example, the quaking or trembling aspen (P. tremuloides) of North America is used for paper pulp. Fast-growing hybrid poplars are grown on plantations in many areas for pulpwood and used for the manufacture of paper (Peupliers de France). Poplar was the most common wood used in Italy for panel paintings; the Mona Lisa and, indeed, most famous early renaissance Italian paintings are on poplar. Due to its tannic acid content, the bark has been used in Europe for tanning leather (Keeler 1900). Veneer is another product of poplar, and the Ontario balsam poplar (P. balsamifera) is used to produce a resin used in medicine. There has been some interest in using Populus species as an energy crop for biofuel, particularly in light of its high energy in—energy out ratio, large carbon mitigation potential, and fast growth. Poplar wood also, particularly when seasoned, makes a good hearth for a bow drill. It was picked as the material for the bones of "Buster," the crash test dummy used in the TV show MythBusters, after some experiments revealed that it fractures under approximately the same loads as human bone. Poplar is sometimes used in the bodies of electric guitars and drums. A folk tradition noted among Michigan miners in the nineteenth century asserted that poplar wood was used to make the cross upon which Jesus Christ was crucified (Kidder 1900). Members of Populus are important as food and habitat for many animals. Various species are a favorite food source for animals. Beavers eat the bark and leaves of some species and also use the branches in building their dams. Elk, moose, and deer browse on young twigs and leaves; grouse eat the winter buds; snowshoe hares eat the bark; and larvae of a large number of Lepidoptera species feed on the leaves. Eckenwalder, J. E. 1977. North American cottonwoods (Populus, Salicaceae) of sections Abaso and Aigeiros. J. Arnold Arbor 58: 193-208. Hamzeh, M., and S. Dayanandan. 2004. Phylogeny of Populus (Salicaceae) based on nucleotide sequences of chloroplast TRNT-TRNF region and nuclear rDNA. Amer. J. Bot 91: 1398-1408. Retrieved May 9, 2008. Joint Genome Institute (JGI). 2006. Populus trichocarpa. Joint Genome Institute. Retrieved May 9, 2008. Keeler, H. L. 1900. Our Native Trees and How to Identify Them. New York: Charles Scriber's Sons. Kidder, H. R. 1900. Why the poplar stirs. Superstition of miners in Michigan. The Journal of American Folklore 13(50): 226. Meikle, R. D. 1984. Willows and Poplars of Great Britain and Ireland. BSBI Handbook No. 4. ISBN 0901158070. Peupliers de France. n.d. [European poplar cultivation. Peupliers de France. Retrieved May 9, 2008. This page was last modified on 3 September 2008, at 17:38.